Shiva Chalisa is a prayer for Lord Shiva - one of the Gods of Hindu trinity, the other two being Brahma and Vishnu. Shiva Chalisa praises the Lord and asks for his help in removing hardships and obstacles in devotee's life. It is said that devotees seeking blessings of Lord Shiva must recite Shiva Chalisa with devotion and sincerity. 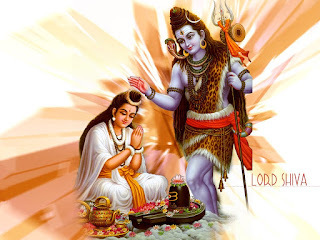 It is suggested that devotees should focus their mind on Lord Shiv or his image and then recite Shiv Chalisa. Varadan Glory to Lord Ganesh, the Divine Son of Goddess Girija, the cause of all auspiciousness and intelligence. Ayodha Dass (the composer of these verses) humbly requests that every one be blessed with the boon of being fearless. Kundal Nagaphani Ke O Glorious Lord, consort of Parvati You are most merciful. You always bless the poor and pious devotees. Your beautiful form is adorned with the moon on Your forehead and on your ears are earrings of snakes' hood. Ko Dekha Naga Muni Mohain The holy Ganges flows from your matted hair. The saints and sages are attracted by Your splendid appearance. Around Your neck is a garland of skulls. White ash beautifies Your Divine form and clothing of lion's skin adorns Your body. Sada Shatrun Chhayakari O Lord, the beloved daughter of Maina on Your left adds to Your splendid appearance. O Wearer of the lion's skin, the trishul in Your hand destroys all enemies. Ko Kahi Jata Na Kauo Nandi and Shri Ganesh along with Lord Shiva appear as beautiful as two lotuses in the middle of an ocean. Poets and philosophers cannot describe the wonderful appearance of Lord Kartikeya and the dark complexioned Ganas (attendants). Tumahi Juhari O Lord, whenever the Deities humbly sought Your assistance, You kindly and graciously uprooted all their problems. You blessed the Deities with Your generous help when the demon Tarak outraged them and You destroyed him. Tumhara Vidit Sansara O Lord, You sent Shadanan without delay and thus destroyed the evil ones Lava and Nimesh. You also destroyed the demon Jalandhara. Your renown is known throughout the world. Pratigya Tasu Purari O Lord, Purari, You saved all Deities and mankind by defeating and destroying the demons Tripurasura. You blessed Your devotee Bhagirath and he was able to accomplish his vow after rigorous penance. Anandi Bhed Nahin Payee O Gracious One, devotees always sings Your glory. Even the Vedas are unable to describe Your greatness. No one is as generous as You are. Nilakantha Tab Nam Kahayee Lord, when the ocean was churned and the deadly poison emerged, out of Your deep compassion for all, You drank the poison and saved the world from destruction. Your throat became blue, thus You are known as Nilakantha. Pariksha Tabahin Purari When Lord Rama worshipped You, He became victorious over the king of demons, Ravana. When Lord Rama wished to worship Thee with one thousand lotus flowers, the Divine Mother, to test the devotion of Shri Ram, hid all the flowers at Your request. Bhaye Prasanna Diye-Ichchhit Var O Lord, You kept on looking at Shri Ram, who wished to offer His lotus-like eyes to worship Thee. When You observed such intense devotion, You were delighted and blessed Him. You granted His heart's desire. Bhramat Rahe Mohin Chain Na Avai Glory be unto You O Gracious, Infinite, Immortal, All-pervading Lord. Evil thought torture me and I keep on travelling aimlessly in this world of mundane existence. No relief seems to be coming my way. Sankat Se Mohin Ana Ubaro O Lord! I beseech Your help and seek your divine blessing at this very moment. Save and protect me. Destroy my enemies with Your Trishul. Release me from the torture of evil thoughts. Kshamahu Nath Aba Chuka Hamari O Lord, You bless the downtrodden with prosperity and grant wisdom to the ignorant. Lord, due to my limited knowledge, I omitted to worship Thee. Please forgive me and shower Your grace upon me. Tapar Hota Hai Shambhu Sahayee O Lord, prostration to You. Even Brahma is unable to describe Thy greatness. Whosoever recites these verses with faith and devotion receives Your infinite blessings.